I heard them coming. The crunch of rubber tires on dried leaves, the click of a rear derailleur, the gentle whoosh of spokes beating the air; there was no need to look over my shoulder because I knew I had company. I held my line and waited. Surely one of them would offer up a standard, “On your left.” No such luck. Instead of giving me notice of their position, I got a smile and a hello as they pulled along side of me. And they were decked out in full cycling gear including the tight black shorts, jerseys, and go fast sunglasses. 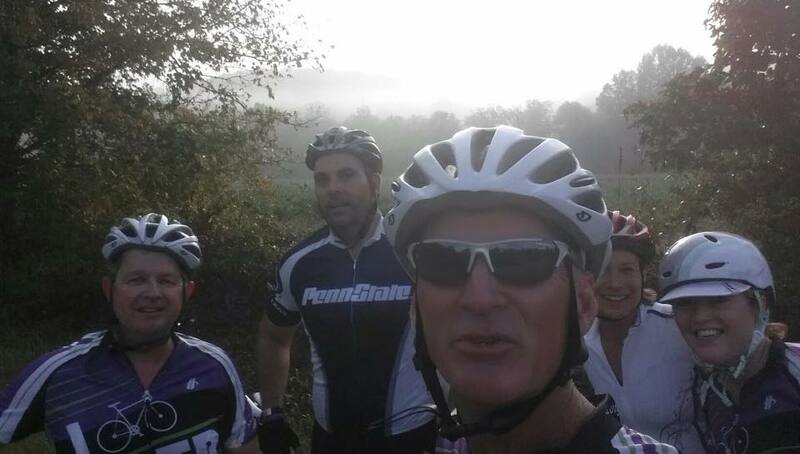 Myself and a few teammates on an early morning 60 mile ride to North Carolina and back. Cycling, especially on a narrow-tired road bike, is all about balance and center of gravity, or CG. In order to maintain an optimal CG, you need to control yourself. One must keep sudden movements to a minimum, no quick jerks of the head, arms, or shoulders. Keep your CG over the center of the bike and it’s much easier to coax the bike along a straight line. If you’re constantly twisting and turning then you’re CG will constantly shift, and you’ll dodge and dart all over the road. And when you’re riding with another person, or a group of cyclists, a straight smooth line and a balanced CG means you will remain upright. The consequences of not remaining upright can be startling; there’s concrete and asphalt, fences and guardrails, and all those spinning metal pieces. And that’s why a cyclist should never pass another cyclist, jogger, walker, stroller, or grandmother without a little notice. A too-quick twist of the handlebars, or a small pothole hit at the wrong angle is enough to send a cyclist on a narrow-tired road bike to the asphalt. However, there’s a lot of folks on the Rabbit riding rental bikes or beach cruisers, and they’re not thinking about their CG, they’re just out for a fun ride. They bob, weave, make unannounced 180 degree turns, and dart about the trail. And that’s fine because the Swamp Rabbit is there for everyone. The Rabbit is not the place for carrying a lot of speed. You want to go fast? Paris Mountain is right over there. I’ll even show you the way up, and the fast way down. Greenville is blessed with hundreds of miles of cycling friendly roads within easy access of the Rabbit, and there’s numerous cycling teams, clubs, shops, and their accompanying rides for all levels. The Swamp Rabbit, however, is full of strollers, grandmothers, training wheels, runners, train tracks, little kids, joggers, walkers, and tourists. The Swamp Rabbit was not built to provide burgeoning triathletes or future Greg LeMonds a high-speed playground. So please be nice. And that means letting other cyclists, walkers, runners, and grandmothers know you’re approaching. All you have to do is tell them you’re passing. You don’t have to yell it, you just say it as you get close. The point is to let them know not to move into your path. You’re not trying to scare anyone, you’re just being courteous and cautious. And for Pete’s sake, when a cyclist approaches a group of walkers, or moms with strollers, slow the heck down. My rule of thumb when approaching a group is the more unorganized they look, the more warning they’ll need. A big group of moms and dads with little ones will need more warning that one or two joggers running a clean, straight line. Which brings me back to the two cyclists that passed me. If they don’t know or care enough to warn another cyclist, they’re probably not warning the grandmothers, joggers, and moms with strollers. If we as cyclists cannot self-enforce our own speed on the Swamp Rabbit, there’s going to be a nasty accident. And when a cyclist has a high-speed crash with a mom and her stroller, the city will have to figure out how to control the cyclists, not the strollers. Is that what we want? 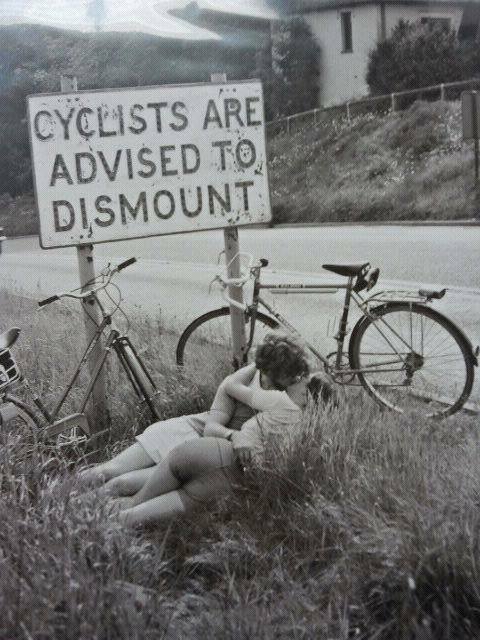 This is the dismount we’re really looking for.